Orlebar Brown has turned out a capsule collection of bathing suits that pay homage to Mustique, a hideaway for the elite. As the chill that comes with the holiday season sets in, so do our plans for our annual escape to somewhere a little more tropical. And though it seems that we’ve been going to the same places on a bit of a circuit for the last few years, a new capsule collection from swim brand Orlebar Brown brings attention to a small, idyllic vacation spot tucked away in the Caribbean: Mustique Island. For over 50 years, Mustique Island has been a getaway for a very exclusive group of people — We’re talking Mick Jagger, the United Kingdom’s royal family, Tommy Hilfiger, exclusive. Set in the string of islands that compose St. Vincent and the Grenadines, Mustique is privately owned by a cohort of about 80 property owners that own just over 100 villas. And while the individual, multi-room villas are all Instagram-worthy on their own, it’s the stories behind the spaces and the people who inhabit them (like say, the divorced couple who now live side by side after the husband came out as gay) that keep the parties and lore going well into the night. Orlebar Brown’s new three-piece capsule collection pays homage to the island and the tucked away pleasures found there. 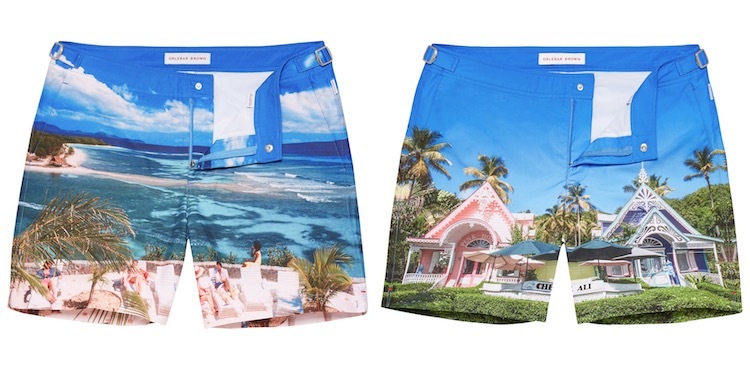 In celebration of the island’s 50th year anniversary, the Chanel-owned brand has taken iconic photos of Mustique must-sees and turned them into the eye-catching, tailored trunks they are known for. The Pink and Purple Houses on the island, perfect for picking up whatever beachwear you forgot to bring on the trip, are the focal point of one pair while others show the beautiful beaches the island boasts. In fact one image, which features people milling about the island above the crystal clear water, is shot by the iconic photographer Slim Aarons — a legendary society photographer — in an image from 1989. In it Pierre Vincent Marais is on holiday with friends, some of whom are still on the island to this day. While experiencing the fullness of Mustique requires a flight to St. Lucia, then a small hop to the island itself, and booking yourself at one of the villas which can carry a lofty price tag (there are two hotels but trust us, if you want the full experience, villa is the only way to go) the shorts break off a piece of that paradise just for you wherever you are. The capsule is available on Mustique Island, orlebarbrown.com and in select retail stores.